Hey yinz guys, good afternoon! As I write this, Thursday is approaching an end, which means the end of the work week is not too far off, meaning it’s almost time for the weekend to start! Probably the best news I’ve heard all day. Do you have your weekend plans all figured out yet? If not, then please allow me to offer a few suggestions — I’ve got the details about some shows taking place around town on Friday and Saturday, and trust me, you aren’t going to want to miss these! Friday 3 August 2012 | 9:00pm | $1 admission PLUS receive a free copy of the CD! 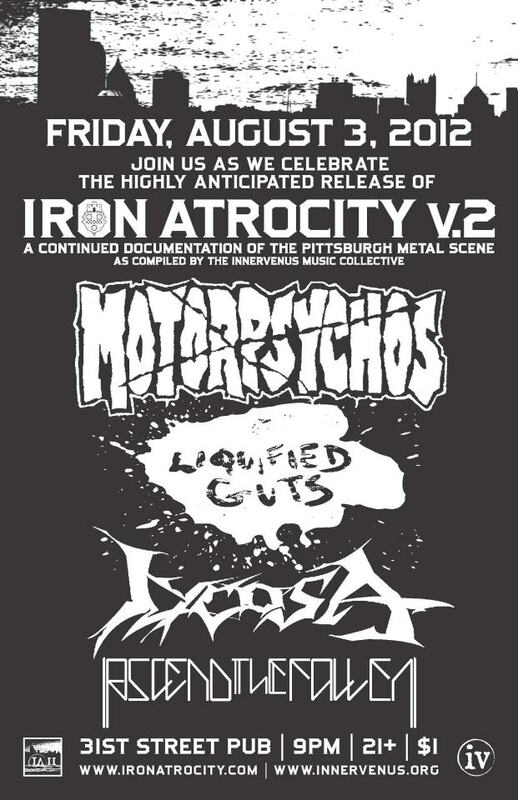 Celebrate the official release of Iron Atrocity V.2, a continued documentation of the Pittsburgh metal scene. Four of the sixteen bands included on the compilation will be performing this night, and your admission price includes a FREE copy of the CD! If you haven’t already downloaded the compilation (also free! ), or even if you have, but you want to read my witty one-liner style review of each of the tracks, check it out here. More details (and RSVP) here. A pair of bands are descending on Howler’s from Michigan! Blues-based punk or punk-based blues, you make the call, when you check out Flint’s Empty Orchestra (that’s English for karaoke). They’ve brought along the self-described sad/slowcore Shores from Grand Rapids. 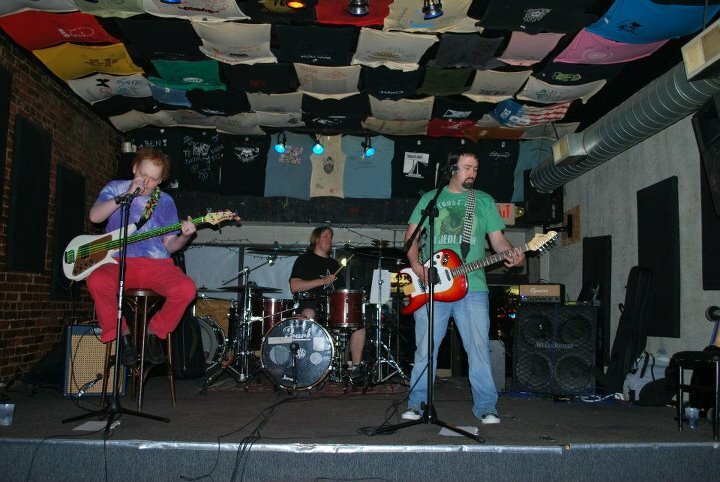 Opening the festivities will be our good ole buddies Ernie and the Berts! 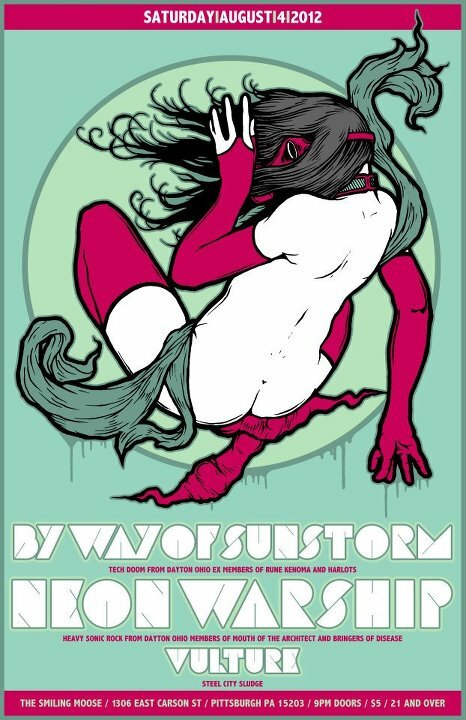 The Moose is welcoming a pair of visitors from Dayton: By Way of Sunstorm (“Tech Doom”) and Neon Warship (“heavy, balls to the wall rock”). And of course we’re all familiar with the local opener, Vulture (“Steel City Sludge”). 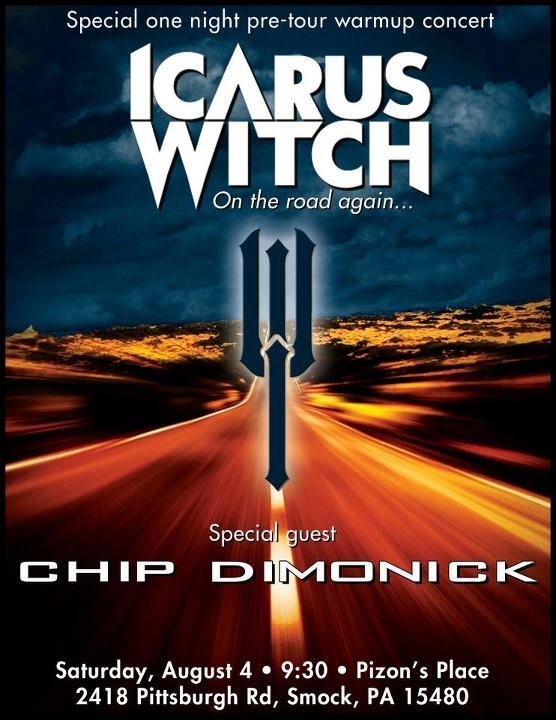 Fresh off the release of their brand-new album Rise (review here), Icarus Witch are taking off on a tour in support of White Wizzard (details here)! Before they leave, though, they’re celebrating with one more hometown show, alongside their friends in the Chip DiMonick band. And, as always, don’t come crying to me if you have a boring weekend, I’m doing my best to help here! This entry was posted in Free Downloads, Free Stuff, New Releases, Pittsburgh, Shows and tagged 31st Street Pub, Allure of the Earth Productions, Ascend the Fallen, By Way of Sunstorm, Chip DiMonick, Empty Orchestra, Ernie and the Berts, Howlers Coyote Cafe, Icarus Witch, Innervenus, Iron Atrocity, Liquified Guts, Lycosa, Motorpsychos, Neon Warship, Pennsylvania, Pittsburgh, Pizon's Place, Shores, The Smiling Moose, USA, Vulture, White Wizzard. Bookmark the permalink.